Monalisa cookware featuring a unique 7 layer patent base makes cooking a breeze. 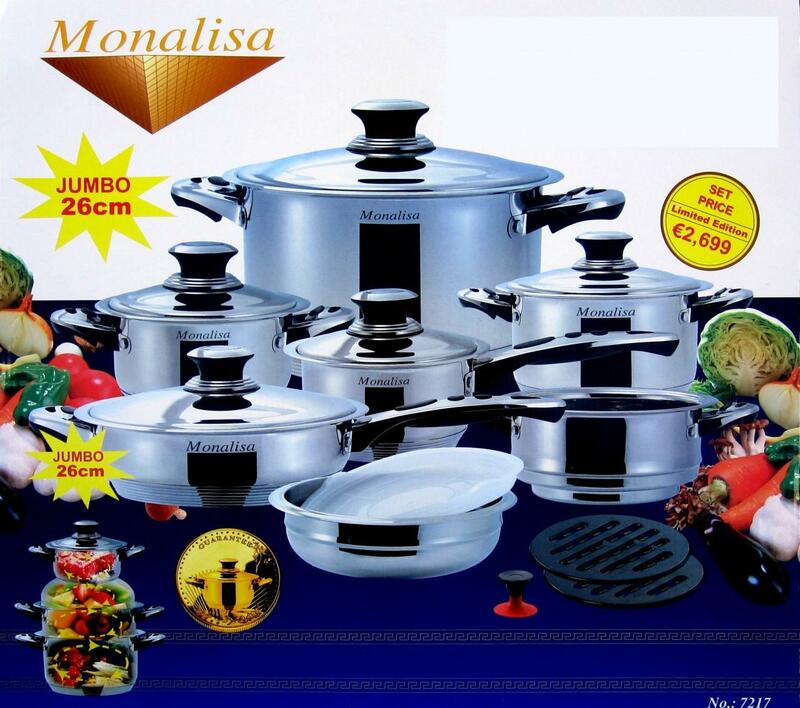 With it's unique product innovation and extensive research Monalisa produces high standard and quality cookware that will last a lifetime. - High – quality surgical stainless steel 18/10 T304. - Thermal sandwich base: 7 layer patented base with multi layered heat conducting protection under Din# 44904, the industries norm for this high quality cookware. - Fast, even heat distribution. - Suitable for electric, gas ranges, vitro-ceramic hobs, halogen plates and induction. - Healthy cooking: waterless cooking and frying for a high conservation of vitamins, minerals, and flavor is preserved which makes it suitable for dietary eating. Resulting in not adding salt since it keeps its natural flavor. - Drip less rim design for easy pouring. - The safe grip handles stay cool, which make it easier for the consumer to handle. High quality surgical steel. Ideal for Induction cooking. Seven layers of heat conducting cores for perfect heat distrabution.